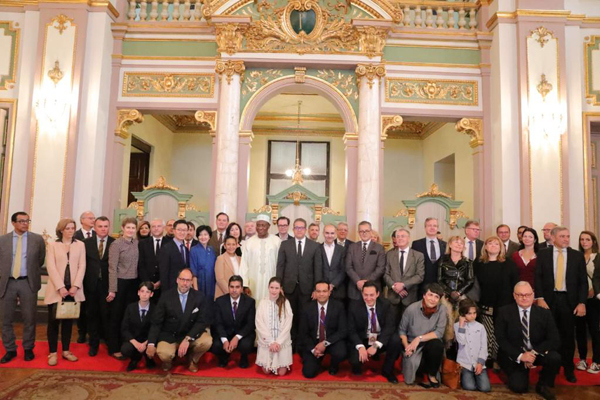 Ambassadors from 30 countries paid a visit to Abdeen Palace in downtown Cairo on Saturday, organised by the antiquities ministry. 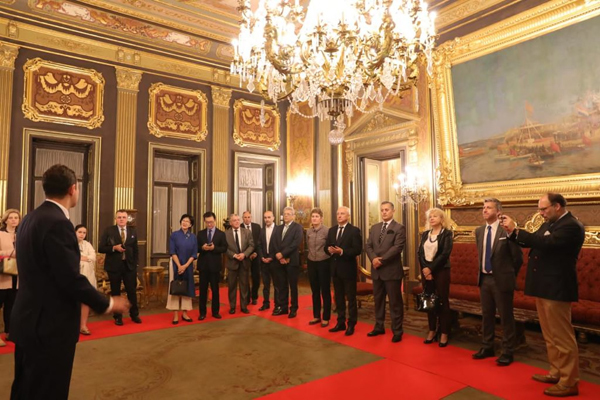 Among them were the ambassadors of Germany, France, Italy, the European Union, Cameroon, Belgium, Russia, Malta, Holland, Sweden, Brazil, Mexico, Argentina, Hungary, Cyprus, the Czech Republic, Armenia, and South Korea. The visit came within the framework of the country’s policy to highlight its historical sites and landmarks. It also came within the series of trips to archaeological sites for ambassadors that the antiquities ministry is organising. Along the past two years the ministry has organised trips to St. Catherine, New Valley, Abu Simbel and other locations. 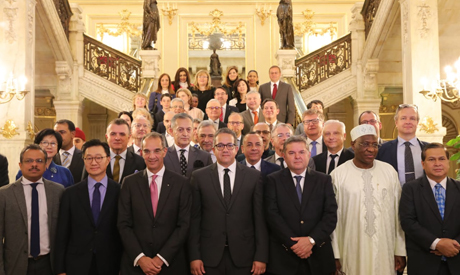 Responding to the invitation of Minister of Antiquities Khaled El-Enany, Minister of Communications Amr Talaat and Minister of Public Enterprises Hisham Tawfik also attended the tour. 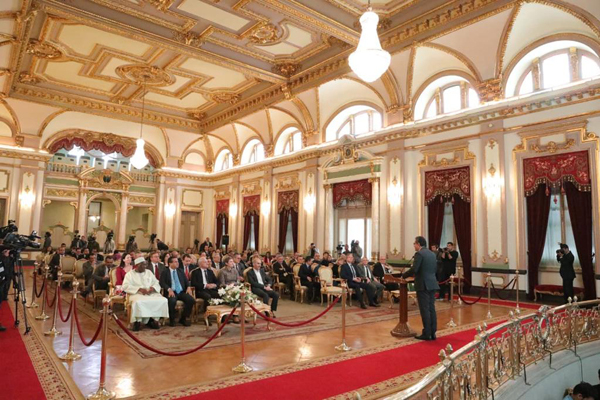 During the tour all the invitees were impressed with the beauty of the palace and its exquisite architecture and distinguished interior decorations and design, as well as the priceless furniture, artefacts and antiques on display within its halls, which reflect a very important period in Egypt’s history. Abdeen Palace was designed by a number of architectures under the supervision of French architect Lion Rosso. It has a neo-classic architectural style and was built in 1863. It was the palace of Egypt’s monarchs from then until 1952. 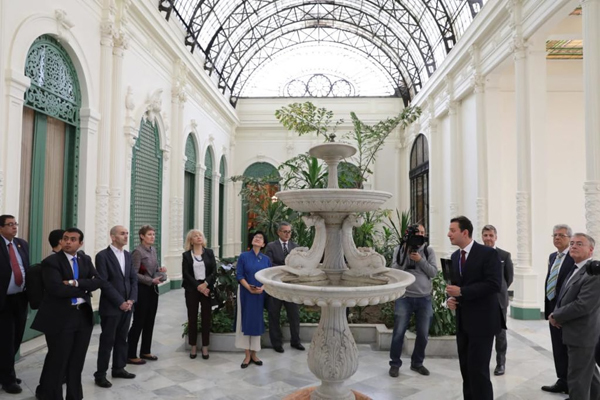 The visit on Saturday is the first in a series of visits to presidential palaces, in an attempt to shed more light on the country’s royal heritage in modern Egyptian history, which is not less valuable than the country’s ancient, Islamic, and Coptic heritage. During the visit, El-Enany said that three new discoveries will be announced soon, and that there will be inaugurations of a number of archaeological projects in different governorates. Talaat also delivered a lecture about Abdeen Palace and the history of the Mohamed Ali dynasty.